The Blue Jays had an off day, as did their two highest minor league teams so there’s a little bit less action than normal to discuss today. Roster Move: The Blue Jays claimed 1B Matt Hague and assigned him to the Buffalo Bisons. A couple of days ago, Scott Copeland was sent back to the New Hampshire Fisher Cats. Despite a five-spot for the Flying Tigers in the top of the eighth inning to tie the game, the Blue Jays got one back in the bottom and held on for a 10-9 victory in a wild game. Starter Jesse Hernandez was pretty solid, allowing four runs (but only one was earned) over five innings before getting 1 1/3 innings of solid relief from Tony Davis despite walking three. Danny Barnes stranded two runners in the seventh but was tagged for four hits and a walk around a strikeout in the eighth. Arik Sikula came in and earned a blown save for giving up two consecutive singles that cashed two more runs, both charged to Barnes. Fortunately, Barnes and Sikula were both let off the hook when Nick Baligod took a walk with the bases loaded in the bottom of the eighth to score L.B. Dantzler, the game’s winning run. Sikula struck out the side in the top of the ninth to seal the victory. On the offensive side of things, Nick Baligod hit a home run and was 2/4 with two runs and three RBI to go with his game-winning walk. Dwight Smith, Jr. was 2/5 with two doubles while Marcus Knecht (2/5, 2B, 2 R, RBI), Shane Opitz (2/4, 2 R, 2 RBI), L.B. Dantzler (2/3, BB, 2 2B, 2 RBI, R) and Jorge Saez (2/3, BB, R) all had two hits. Christian Lopes had three, going 3/5 and scoring once. Brent Powers didn’t have a great day at the office, allowing seven runs on seven hits and three walks over 4 2/3 innings. The bullpen group of Jimmy Cordero, Joe Lovecchio (recently promoted) and Scott Silverstein combined for 3 1/3 scoreless innings to keep the Lugnuts in the game. The offense made the most of their five hits, taking five walks and scoring five times. Derrick Loveless drove in two runs, going 1/3 with a walk and a double while David Harris hit his sixth home run of the year and Jason Leblebijian was 2/4. The Canadians dropped a rare game but the offense was booming as Ryan McBroom launched his team-leading eighth home run of the year. Mike Reeves also hit one, his first as a Canadian this season while Tim Locastro was 1/2 with a walk, a hit-by-pitch (his trademark) and a stolen base. Chase Mallard wasn’t good on the mound, allowing five runs (four earned) over 5 2/3 innings on just three hits and two walks. Adaric Kelly was charged with another two runs without giving up a hit while Mark Biggs let both of his inherited runners (from Kelly) score as well as one of his own. Grayson Huffman had a short outing, going three innings and allowing two runs (one earned) on four hits and three walks with four strikeouts. Carlos Ramirez went three innings, giving up only one hit but another unearned run. Alberto Guzman finished the game with two innings and allowed two runs on five hits and a walk. 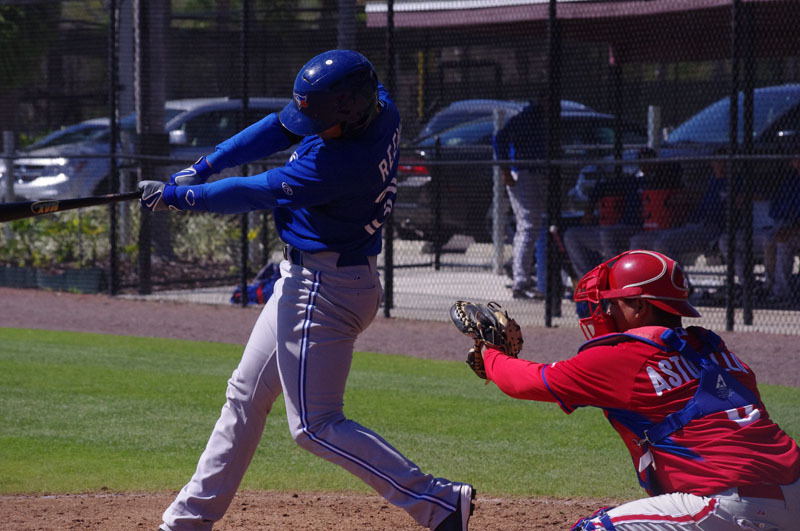 The Blue Jays had six hits including two from Richard Urena and Lane Thomas. Kramer Champlin made a rehab start with the GCL Jays and was successful over his inning at the start of the game. Nick Wells went four innings and allowed two runs on five hits but Sean Reid-Foley had three scoreless innings of his own, allowing three hits and a walk and striking out four. Angel Gomez was 2/3 with two doubles and a stolen base and Juan Kelly was 3/4 with an RBI while Juan Tejada was 1/4 with a solo home run. Wilfri Aleton was the pitching star for the Blue Jays, going 4 2/3 innings, allowing one hit and one walk with four strikeouts. Bryan Lizardo has been heating up and he was 3/4 with two doubles, an RBI and a run. Rodrigo Orozco and Edward Olivares didn’t have a hit between them but they combined for five of the club’s six walks. Sean Nolin takes on the Rochester Red Wings as the Bisons are at home for a 7:05 PM game on MiLB TV. The Fisher Cats haven’t announced their starter against the Trenton Thunder on the road at 7:05 PM on MiLB TV. Taylor Cole is scheduled to go for the Dunedin Blue Jays as they play the Lakeland Flying Tigers at home at 6:30 PM. The Lugnuts try to turn around their latest slide with Brad Allen facing the West Michigan Whitecaps at 7:00 PM on MiLB TV. The Vancouver Canadians have an unannounced starter as they play the Boise Hawks at home at 10:05 PM ET. Bluefield has an unannounced starter on the mound against the Burlington Royals on the road at 7:00 PM.